Helen, a native of Dublin, has been a professional potter for over 20 years. This includes the experience of a 3 year apprenticeship with Stephen Pearce and master classes with Helena Brennan. Combining an interest in art with a practical personality, Helen decided from a young age that she was going to make functional ceramics. Moving to West Cork, with partner Eithne, in 2000 to take over the small pottery business at Dunbeacon was the great opportunity to establish her own studio. Prior to West Cork, Helen’s design style tended towards the architectural with a strong emphasis on form and functionality. Influenced by the hills and coastline of the Wild Atlantic Way, and working overlooking the water of Dunmanus bay, Helen has designed and developed the classic Dunbeacon Pottery ranges. The contemporary and functional shapes along with the soft glazes give the pottery a West Cork identity that feels equally at home in urban settings. The glazes are based on traditional recipes which have been developed by Helen, and mixed by hand at the Dunbeacon Pottery workshop. The workshop is open to the public most days throughout the year. 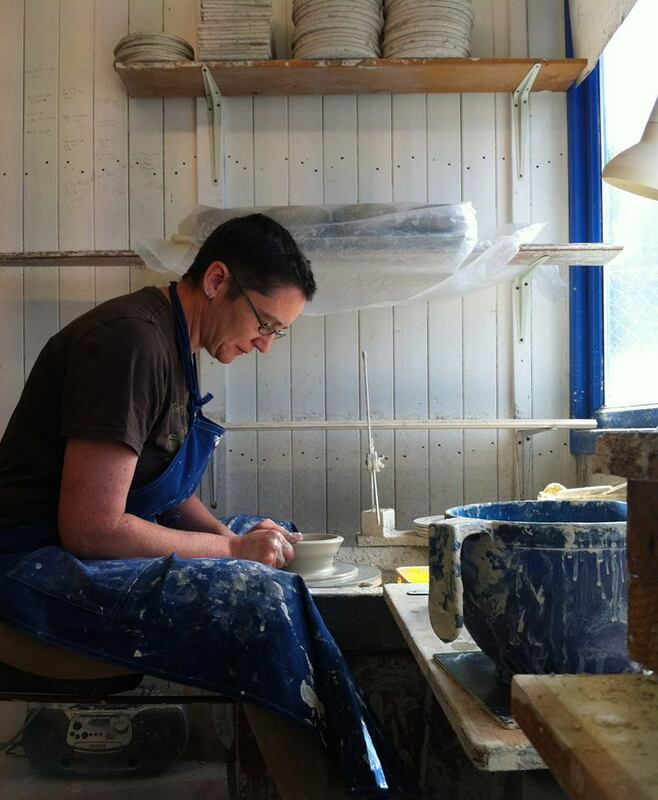 The entire making process can be viewed at the workshop, from the processing of the raw stoneware clay to the finished range of hand crafted Irish ceramics for sale in the showroom. Each piece is individually handmade by Helen while having continuity of form. The three ranges, Ocean, Woodland and Bog Cotton are interchangeable with each other, but also stand alone in equal beauty. These pieces are dishwasher safe, with a solid form and functionality that reflects the landscape where they are created.